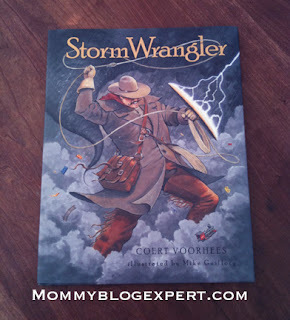 The charm of the American Cowboy and The West shines through in Storm Wrangler, the poetic and beautifully illustrated newly released young child's title. This book is written by Fulbright Scholar and American Library Association Award-winning author Coert Voorhees and illustrated by Mike Guillory, a talented Houston illustrator and designer, who are both heavily influenced by the Texas lifestyle in this work. As the tale unfolds, the fantasy story is told through the title character's persona as a meteorological cowboy style Paul Bunyan protecting all from the power of big, and sometimes scary, weather. No matter if it's lightening and a thunderstorm, a tornado, a hurricane, a blizzard or other type of fierce atmospheric phenomena, the friendly and fearless Storm Wrangler is depicted as a hero that kids will look up to and learn from. As a hard cover, large format picture book the story comes alive, intimately speaking to readers on every page, transforming fear into awe as amazing details about a variety of storms are demonstrated along with delivering the constant promise of calm that always comes after. Inspired by the author's son's own fears during Hurricane Ike in 2009, this tale no doubt will bring little heads across America out from under the covers whenever this is read. It's classified as children's fiction but it certainly is educational too, with a glossary of 20 weather terms included. Distinguished child psychiatrist Efrain Bleiberg, MD, professor and Vice Chair, Menninger Department of Psychiatry; Director of Children and Adolescent Psychiatry, Baylor College of Medicine; Chief, Psychiatry Service, Texas Children’s Hospital has glowing praise for Storm Wrangler. Summarizing the mental benefits to toddlers and young kids this offers, Dr. Bleiberg says, “This is a wonderful picture book ... a lovely springboard to help children develop a sense of security." Voorhees, also the author of the Young Adult title The Brothers of Torres, is currently at work on other novels. He is the mayor of Grammaropolis an animated website that also features a Top Ten Education iPhone app and a SiriusXM Children's Radio hit song. Who hasn't been afraid during a storm at one time or another? I for one, still remember many a night as a kid seeking safety in my parents' bed from the crashing thunder. Please leave a comment to reminisce about your own childhood storm fears or that of your child's and how you've dealt with it. FTC Disclosure: I received the Storm Wrangler to facilitate this book review. 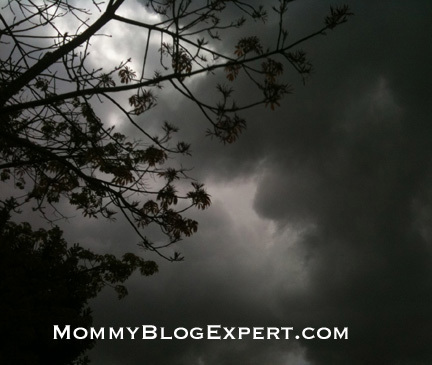 However, MommyBlogExpert did not receive any payment or other compensation associated with this post. See complete FTC Disclosure information that appears at the bottom of MommyBlogExpert's main page and at the bottom of every individual post on this blog, including this one.